Noball standing on a Crusader tank. Noball was the pet of one of our tank commanders, called John Cloudsley-Thompson, in the Desert War in North Africa. 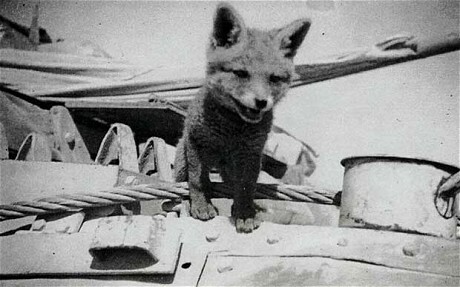 His nickname was Highball, so the rest of the tank crew called the fox Noball. John was always interested in animals, and used to defuse the tension of waiting for battle, by directing his crew to hunt for spiders and scorpions, and getting them to look after Noball. John actually bought Noball from local people in the Desert, for half a piastre (about half a penny!) and two bananas. Noball made a lair for himself behind the wireless set in John’s tank, and never tried to escape. But Noball did visit other tank crews to scrounge extra bully beef. One day Noball got lost inside the tank engine and the whole Squadron was held up until they rescued him!